Intervention technology : Even though a bednet is something simple that every village tailor can make, many technical issues are associated with netting durability and the insecticide treatment. There is also an issue with mosquito nets in houses in which a normal net cannot be hung (for example because the space is insufficient). Conventional insecticide needs to be renewed every 6-12 months. Experience in many settings showed that many people did not bother to perform these re-treatments. ITNs require the combination of two totally different products, a bednet and an insecticide. One is produced in a textile mill and the other one by a chemical industry. At the outset, programmes attempted to bundle nets with an insecticide sachet, such as in Tanzania. Fortunately, the development of long-lasting insecticidal nets (LLINs) has largely solved this issue and there are currently six excellent products on the market. Implementation models : Early experiences showed a broad variety of implementation approaches that worked and others that did not. Sometimes there was a potential demand but no supply; sometimes people wanted nets but could not afford them at market prices, and in a third case people wanted to buy nets but local dealers would not stock them because the margins were not attractive or for other reasons. In China and Vietnam, dissemination was organised as a public health strategy: the private households had to buy the net and the malaria control programme would give them the insecticide for free. Another approach was to target the most vulnerable groups (pregnant mothers and their newborns) through a public health system delivery (free in Eritrea, highly subsidised in Kenya and Malawi). In recent years many countries have also had free distribution of nets linked to measles or polio vaccination campaigns. Tanzania chose a combination of several elements based on an approach involving largely the private sector. This was based on the conviction that “one size does not fit all” and that people would need different types of nets, and the only way to deliver this choice of products was by setting-up a supply chain that would reach even remote villages. Further, there was a realisation that the public health system was not strong enough to deliver ITNs consistently over the next decades. Promotion : Sleeping under a bednet implies behavioural changes and this always takes time. Social marketing was thus felt to be required to spread the right messages and to ensure the right use of the nets. One of the key messages of a social marketing campaign of Population Services International (PSI) was: “Malaria Haikubaliki – Malaria is not acceptable”. People perceived malaria as something so common that they had into way to deal with it. This attitude needs to be changed before meaningful progress can be made. Affordability is clearly the most important hurdle for the dissemination of ITNs, especially in rural areas (where the coverage is less than that of urban areas). The number of children below the age of one sleeping under any net has increased from 31% to 55% (from 2005 to 2007) and the same figure for treated nets are 12% to 34%. Even with the voucher subsidy , the top-up price of one dollar seems to be a hurdle for many poor women. “Lack of money” is a reason for not redeeming about 15% of the vouchers (another 15% are not redeemed for other reasons, including that the woman/mother owns already enough nets). Another big issue are the re-treatment kits. Conventional insecticides lasted only for some six months and are now being replaced by longer-lasting ones lasting over 12 months. But even with improved timing, re-treating existing nets is a problem, with only 20% of nets getting a repeated insecticide treatment. There is now agreement on the need to switch over to long-lasting insecticide-treated (impregnated) nets (LLIN) with a pre-treatment lasting for the entire lifespan of the net of three to four years. However, this switch is technically a big jump for manufacturers and requires the industry to convert from traditional textile industries to a high-tech production. 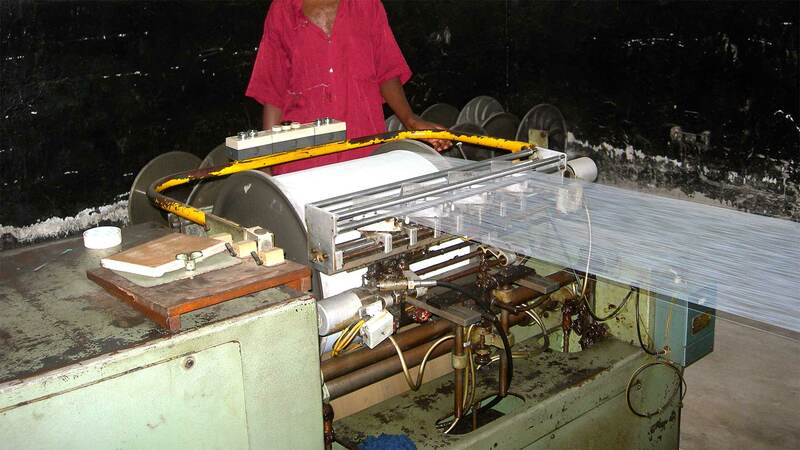 Understandably, the manufacturers are reluctant, due to high investment costs and the small margins they make on a net; some manufacturers claim that their margins are only around TZS 100 per net (US$ 0.09). This may be an understatement but it is a fact that the market is very competitive. Currently, the best LLINs are polyethylene nets with insecticide dissolved into the plastic (Olyset nets). Unfortunately these nets are much more expensive than conventional nets (roughly US$ 6 versus US$ 3 ex-factory) and because of the extreme price elasticity there is currently no market for such a product. On the other hand, LLINs are cheaper per ‘treated net year’ of protection because their higher cost is largely compensated by their much longer use life.